This past Sunday, coastal Colombia came to Chicago through an explosive show put on by Bomba Estéreo (pardon the pun). 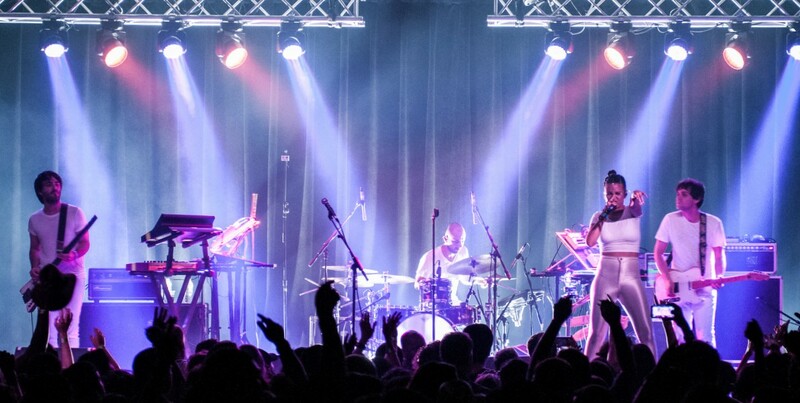 Attracting a large crowd of beautiful people to the Concord Music Hall, Bomba was all energy and no rest while performing their famous tracks and showcasing a lineup of new songs from Amanecer, their most recent studio album. 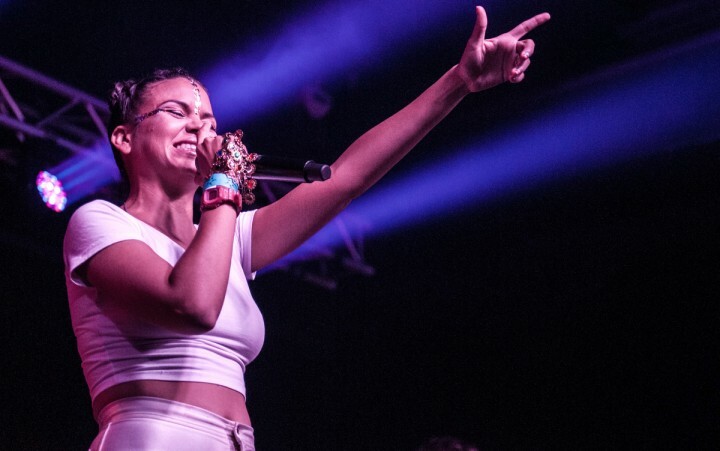 While the band began playing the opening notes to “Baliar Conmigo,” lead singer Liliana Saumet ran out onto the stage in a cute and comfy white ensemble and gold accents on her face, dancing to the beat and smiling at the crowd’s cheers as she began slaying us with her rhymes. 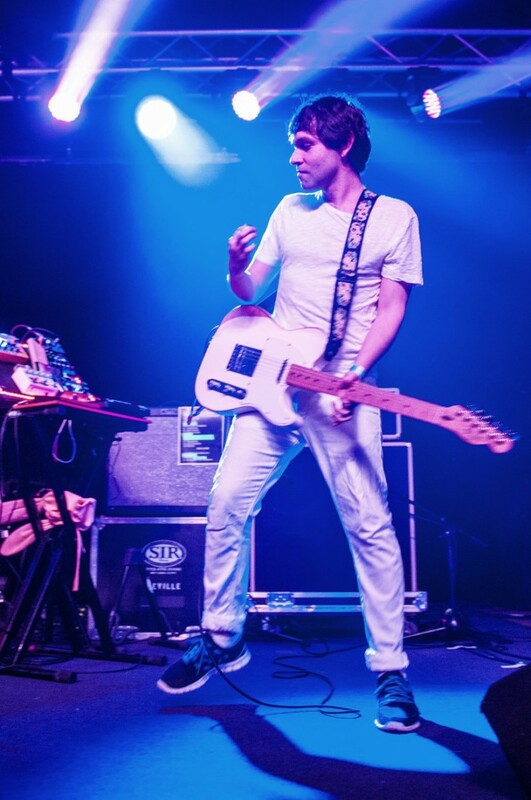 Guitarist Julián Salazar was looking pretty fly too in a matching white ensemble, which he later paired up with some adorable pink bunny ears that at one point Liliana pet (regretting not having a photo of that!). I never really gave much notice to the guitar lines on the new album – or their older songs for that matter – since Bomba’s music is very beat-and-bass-driven cumbia/electronic music, but Julián made his melodies and rhythmic riffs shine through the entire night, complementing the always amazing Simón Mejía on the bass. The guitar sound’s clarity was crisp and pierced through the percussion when it needed to, and at other times was full and brimming with range, thanks to an eclectic array of guitar pedals they had mounted and connected to synthesizers. The band had an impressive spread of equipment to execute their electro tropical music, which is the kind of thing nerds like me geek out about, especially when a band’s music is a parade of various interconnecting influences and styles. Starting from from a simple guitar-bass-drum set up trio and adding on synth, pedal boards, and electric drums – the last of which the band took many opportunities to jam on, transforming some of their songs into extended dance versions. For a few tracks in the middle of the show, a fellow musician came out onto the stage and playing some of the illest conga drumlines I have heard in some time, which really riled up the crowd and gave Bomba’s song an extra kick. Even the people in the audience who were just subtly nodding their heads along to the music finally found themselves feeling Bomba’s beats and all out dancing with the rest of us. 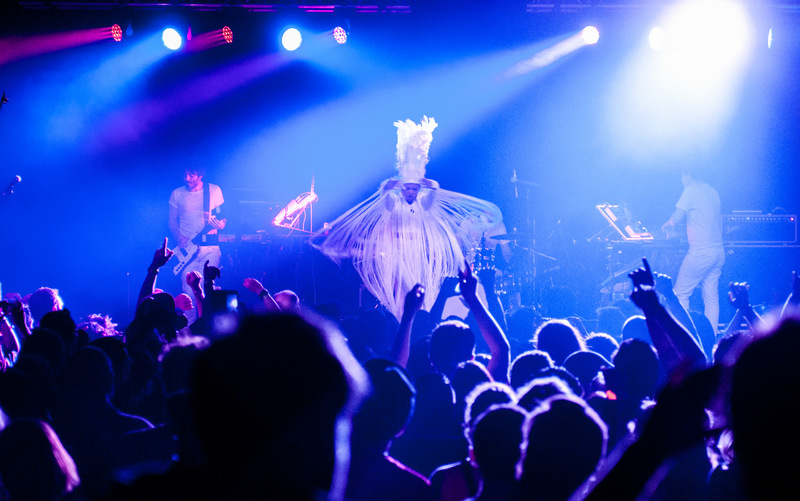 A highlight of the night was during the first encore when Liliana reemerged from backstage in a lovely white feathered costume, appropriately so, for the track off Elegancia Tropical, “Pájaros.” She worked the costume’s tassles (wings?) as she sang and danced across the stage and engaged with the audience that was loving every minute of it. This part of the performance was a peak point in an alreay high-energy yet warm performance given by Liliana the entire night. If you’re not familiar with this excellent band, but want to check out Bomba Estéreo , consider listening to the tracks linked earlier in this article and those that made the crowd explode (last bomb-related pun, I promise): “Sintiendo“, “Soy Yo” and “Somos Dos” – the last of which has a new music video premiering for it this week. Bomba Estéreo’s next stop on their Amanecer tour will be back in their home country, in Barranquilla on the Carribbean coast of Colombia.